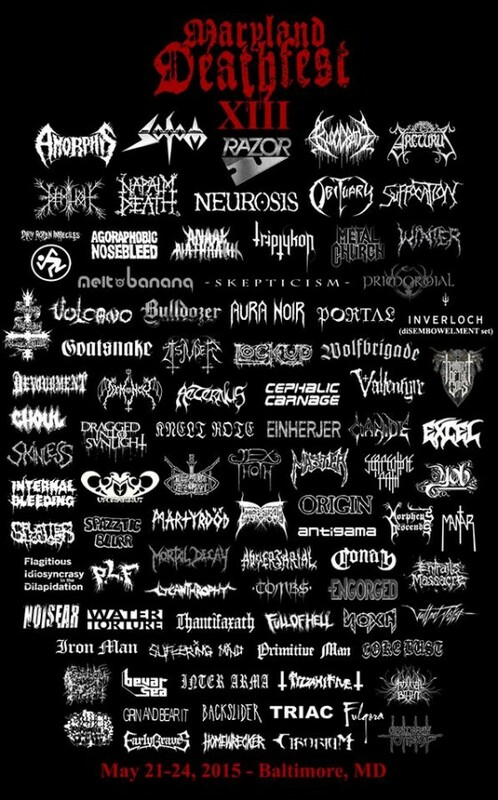 Neurot Recordings is proud to have three major acts from their expansive family of acts confirmed to perform at Maryland Deathfest XIII, the annual festival once again set to take over Baltimore from May 21st to May 24th, with NEUROSIS, UFOMAMMUT and YOB joining the list of more than eighty bands to perform at the 2015 gathering, marking the label’s largest invasion of the annual festival to date. The opening night of Maryland Deathfest XIII, Thursday, May 21st, will see UFOMAMMUT and YOB both making their way to the event for the very first time. The two bands will headline the Rams Head Live stage, taking over the venue with Bevar Sea, Conan, Iron Man, Jex Thoth, Mantar and Primitive Man. And following their mesmerizing and destructive set amidst a thunderstorm at MDF 2011, the mighty NEUROSIS will make their way back to the event this year. A major highlight of the festival, NEUROSIS will perform outdoors on the Edison Lot stage on the final day, Sunday, May 24th, joining Amorphis, Anaal Nathrakh, Demilich, Goatsnake, Inverloch, Neurosis, Primordial, Prosanctus Inferi, Skepticism, Tombs and Winter. NEUROSIS continues to tour the planet, in their most intense years of touring since the band’s earlier days, following the 2012 release of their acclaimed tenth LP, Honor Found In Decay. Following tours of North America, Europe and their first trek to Australia earlier this year, the remainder of 2014 will see the band as one of the main headliners at Arizona’s Southwest Terror Fest III: The Western Front. The festival will consume Tucson, Arizona from October 16th through 19th, with main acts Goatsnake and Sunn O))) in addition to NEUROSIS, who will headline Saturday, October 18th with support from The Body, Author & Punisher and Sorxe. The same weekend, the band will invade Denver on Sunday, October 19th with support from Subrosa and In The Company Of Serpents. The following weekend they’ll join Voivod, Samhain, Danzig, Lustmord, Corrections House, Eyehategod, Napalm Death, Cattle Decapitation, Author & Punisher and more at the second annual Housecore Horror Film Fest, running from October 23rd through 26th in Austin, Texas. And on November 22nd, NEUROSIS will travel to Mexico City to perform at Bestia Festival is set to run from November 19th to the 23rd, with performances from The Ex, Monogatari, (SIC), Han Bennink, Terrie Ex, Marc Ribot, Ray Anderson, Bob Stewart and others performing, alongside an array of music workshops, film screenings and more. Currently celebrating their fifteenth year in existence, Italian trio, UFOMAMMUT, will return to North America for their first major tour of the continent in 2015, including their first trip to Maryland Deathfest. With only a brief 2008 West Coast venture in the US under their belt, the full-on upcoming tour will see the band spending several weeks stateside, bringing their magical, mysterious and pulverizing doom metal to the masses in support of their acclaimed ORO double-album set, released in 2013, as well as their next full-length release, which the band is currently preparing to record in October for release again through Neurot in early 2015. UFOMAMMUT will also be releasing a massive DVD entitled XV through their own Supernatural Cat Records this October, with more than three hours of material documenting their decade-and-a-half together. The band is also set to perform at Up In Smoke in Pratteln, Switzerland with Fu Manchu, Kadavar, Blues Pills, Brant Bjork, Dozer, Naam, Conan and tons more on October 3rd and 4th. Oregon’s psychedelic doom metal trio, YOB, is currently embarked on a massive European tour with Pallbearer, supporting their recently-released seventh studio full-length, Clearing The Path To Ascend. The widely lauded album is currently thriving with great accolades pouring in from media outlets and fans worldwide, being recognized as another massive achievement for the now institutional act, and marks one of the most essential extreme albums of the year. Their first release as part of the Neurot family, the album was just released by the label on CD and all digital download, with Relapse Records releasing the vinyl version this week. Following the ongoing five-week voyage which is permeating every corner of the European continent, YOB will tour heavily in North America as well, with new tour dates to be announced in conjunction with their MDF performance in the coming months. Stand by for further label and tour developments from NEUROSIS, UFOMAMMUT, YOB and other talented acts hailing from the Neurot Recordings clan over the rest of 2014 and into next year. For full tour dates, ticket links and details, visit the NR Tour Page here.